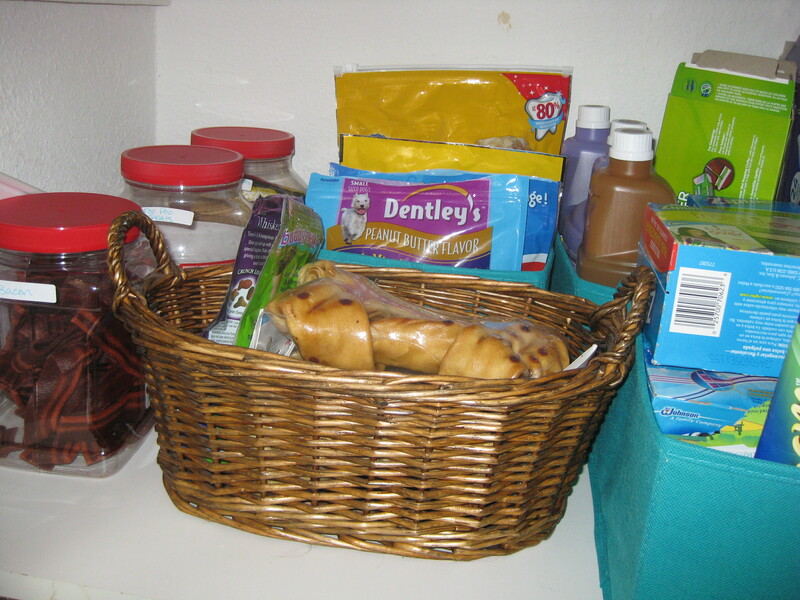 To start my decluttering process, I decided to tackle the kitchen area first, and more specifically, the pantry. Our pantry is typically just a clutter of boxes and cans tossed in wherever we can find a space, much like everyone else’s. I’ve always seen these gorgeous pictures on Pinterest of other people’s pantries and thought, “God, how do they have time to do that? !” There are some VERY crafty people out there. I, on the other hand, do not have time for all that. I have a job that keeps me busy for 50-55 hours a week, 5 pets, and other house cleaning and errands to do on the weekends. I certainly don’t have time to sit around and make cute chalkboard labels or fancy baskets (as much as I wish I did). So, I decided to go the quick, practical route to organizing my pantry, and I’m actually extremely happy with the way it came out! 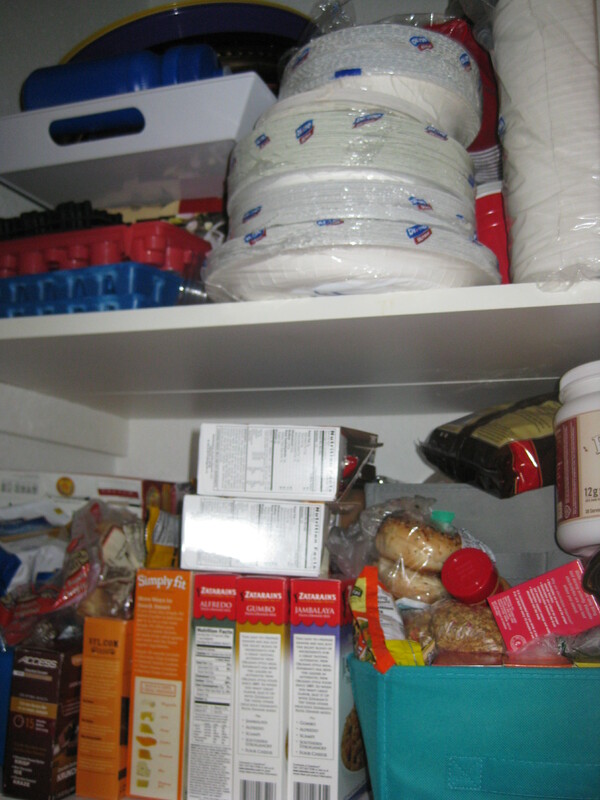 First I’m going to show you what the pantry looked like before I organized it, but you have to promise not to judge! As you can see, I had previously tried to organize by buying cute colored bins and baskets. Well, if you just keep stacking things on top of those bins and baskets like we did, things can get back out of control very quickly. This was an absolute mess. We could never find anything, we didn’t know what we had or what we needed to buy, and every time we opened the pantry at least one thing fell out of it. Does any of this sound familiar? To start, I pulled everything out of the pantry. Every. Single. Thing. I threw away anything that was expired or that we didn’t want, and I categorized the items into cans, baking items, cleaning items, storage (i.e. Ziplock bags), breakfast food, pre-packaged dinners, spices, cooking oils/sauces, and snacks. 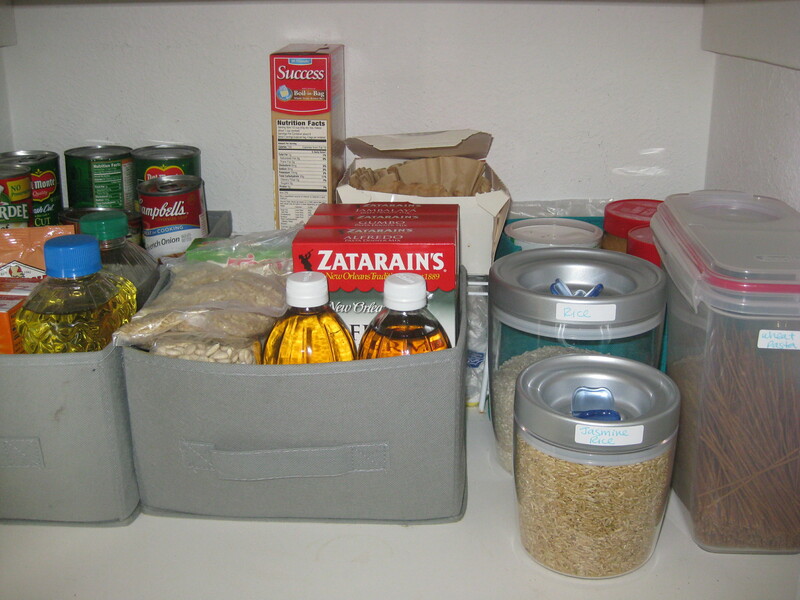 When I decided to do this project, I bought some great clear storage containers from Target (for cereals and pasta) and some clear storage boxes from Home Depot (they were on sale for $5). After I pulled everything out, I wiped down the shelves and the walls inside the pantry and swept out the floor. I then emptied out almost anything that was in a box or a bag: cereal, pasta, chips, snacks, etc. into the storage containers from Target. 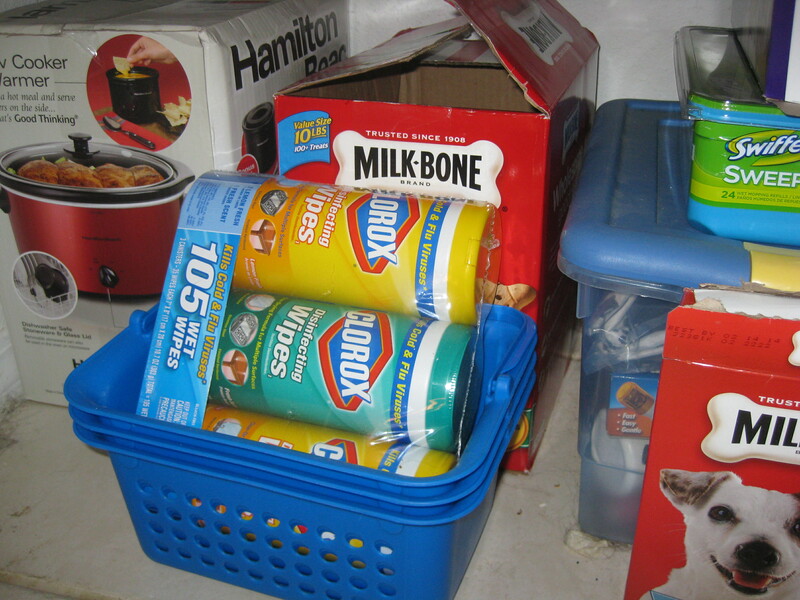 Then, I took the organized piles of food and put each group into one of the storage boxes from Target. For the dog treats, I took advantage of some of the containers we already had. I put all the bacon treats into one container, all the regular treats into one container, and all the rest (cookies, etc.) into one container. After everything was neatly placed into containers, I wrote the contents onto labels (also purchased at Target) and stuck the labels onto the containers. Then, I placed the containers back on the shelves and voila! an organized pantry! 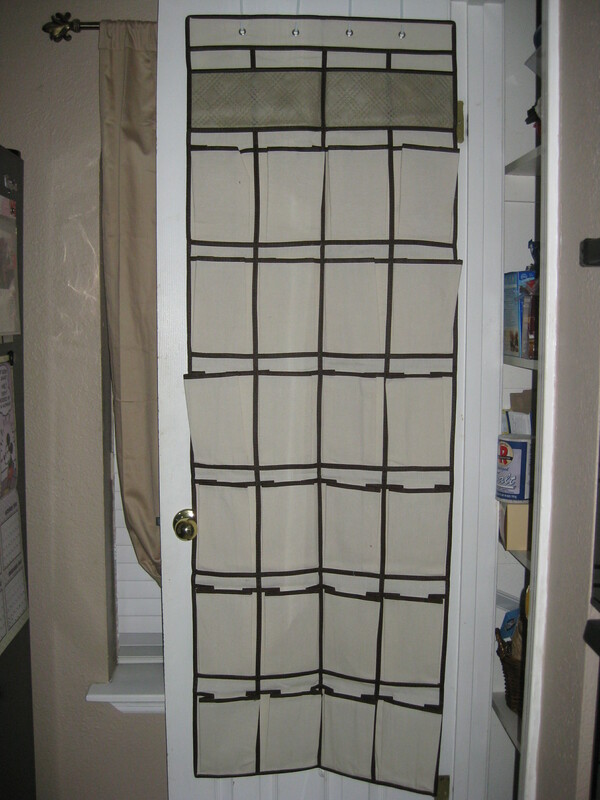 Finally, I also bought a cloth shoe storage organizer from Target and hung it on the back of the pantry door. 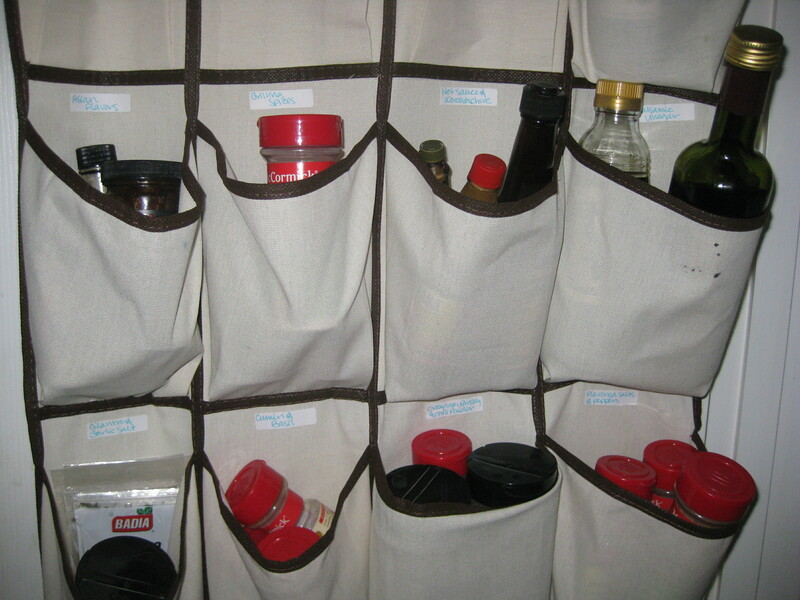 I use this to store all my spices and cooking oils/sauces organized by meal or type of food we cook. For example, all of the Asian sauces/spices are in one pocket, and all the grilling sauces/spices are in another. Everything that we use on a regular basis is at eye level, while things that we don’t use as regularly are higher up or lower down. I also labeled the pockets so that we can easily tell what they hold without having to dig through them. I found that using clear containers worked MUCH better than the colored bins because I can see through them and more easily tell what’s inside at a glance. The labels are really helpful, especially on the bins that you can’t see through. 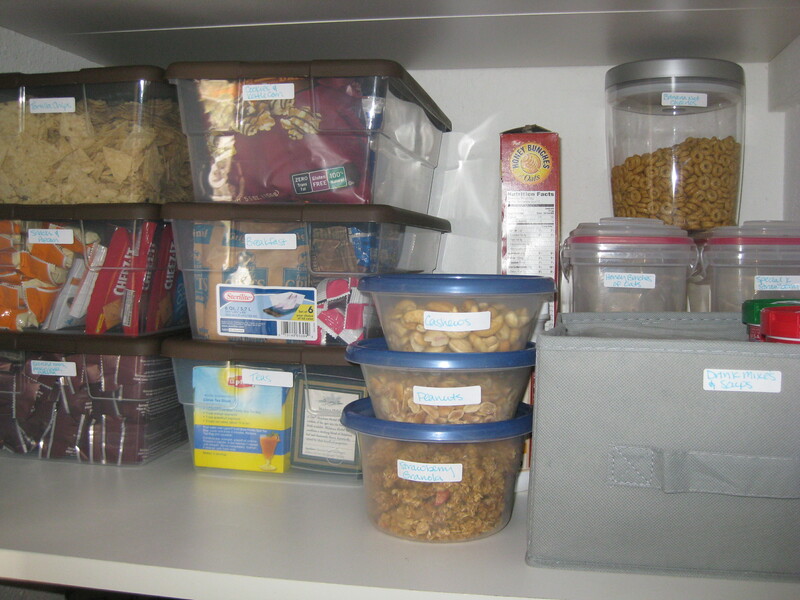 It is now SO much easier to find things in the pantry and will be really easy to keep organized! Just refill the bins! For a final touch, I took the framed list of staples and hung it on the outside of the door. Since it’s a glass frame, it is also dry erase. I keep a magnetic dry erase marker on the fridge and use it to mark up this list, circling what we need to buy, crossing out what we don’t need, and writing in anything that isn’t on the list. At the end of the week, I write it down onto a grocery list and erase! So easy! This project took me about an hour, believe it or not! This is totally doable for people with busy lives like me. Have you completed any home organization projects lately? I would love to see photos and descriptions of what you did! 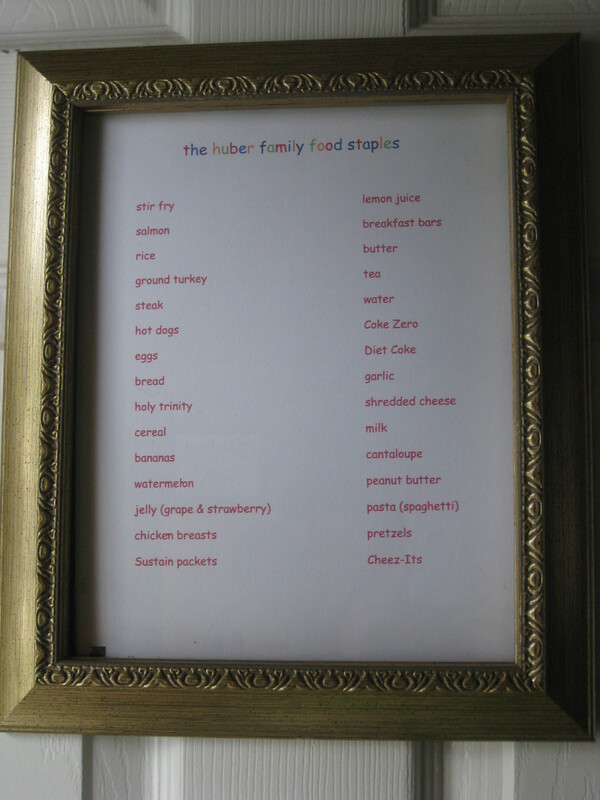 Tags: Home Management, Kitchen Organization, Organization. Bookmark the permalink. What an inspiration!!! I have a small pantry and it is just items stacked upon items. I have been dreading organizing it. Now that I see it could possibly only take an hour, I am gonna jump in and make it happen.